Before and after pictures of saw cut penn. 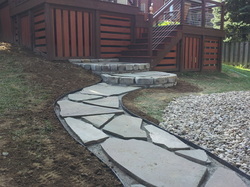 blue flagstone sidewalk for a homeowner in Louisville, Ky.
Before and after pictures of irregular penn. blue flagstone sidewalk for a homeowner in Louisville, Ky.